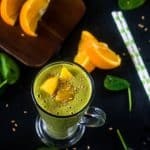 Orange mango green smoothie recipe – Tantalise your taste buds this summer with this zesty orange mango green monster smoothie made with cashew milk. One of my favourite smoothies to make has to be the infamous green monster smoothie – I have no idea as to why they are called green monster smoothies because the name alone makes the smoothie sound more scary then appetising. Well the truth be told, there’s nothing scary about this smoothie, rather it’s inviting and packed with nothing but nutritional value because all of the ingredients included work in unison with the human body. Whenever I’m feeling low for instance, if I’m excessively tired or if my body just simply needs that “pick me up” I whip up a green smoothie. 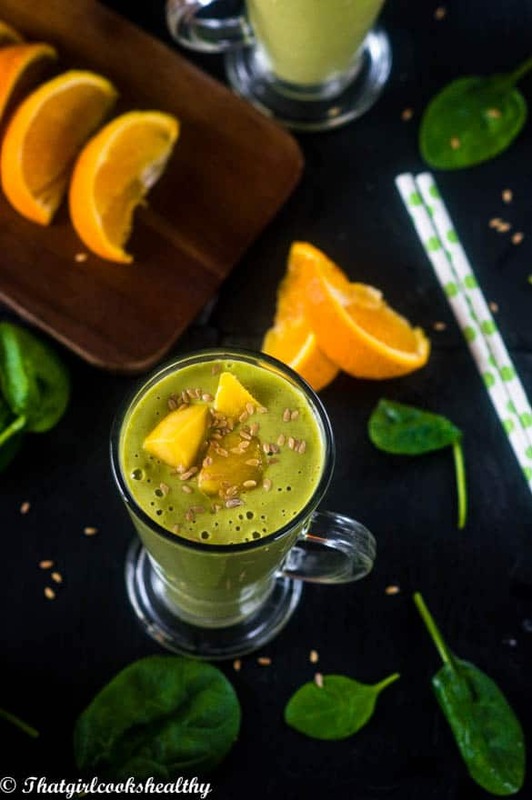 Now green smoothies are very versatile you can add absolutely any superfood to them to supplement the green ingredients – kale or spinach are commonly used. I like to rotate between both of the aforementioned vegetables since I always have some stored in my freezer. Then I will add some fruit of my choice – this one included orange, mango and a few pieces of banana for extra sweetness along with some plant based milk. 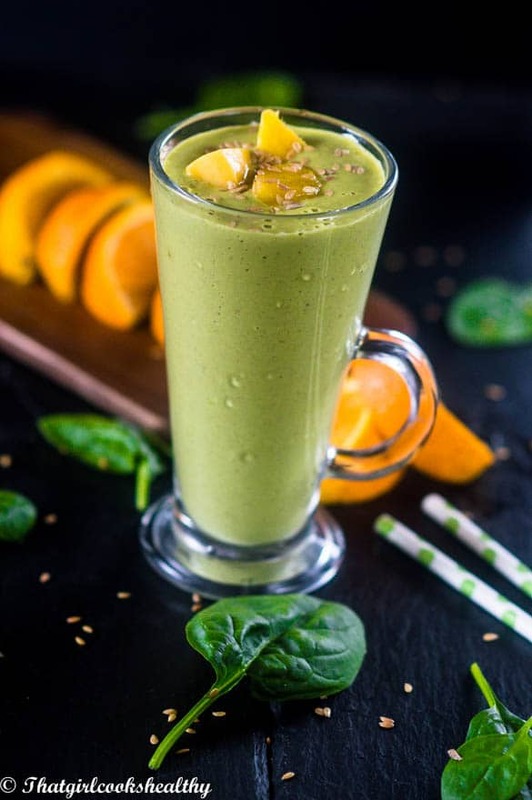 Once I drink this smoothie during any time of the day – breakfast, lunch or even as a meal replacement for dinner (more ingredients included). I’m pretty much contented with a replenished body, so you can follow suite by having this a meal replacement too. One of the key health benefits to drinking a green smoothie is to fight anemia. Anemia is a iron deficiency where there is a decrease in the number of red blood cells produced due to a low levels of iron. Iron is a mineral that is incredibly important to the body as it is needed to produce hemoglobin – a substance in the red blood cells that allows oxygen to be transported to the body’s tissue. People who suffer from sickle cell anemia, an inherited red blood cell disease should be more mindful of consuming oxygen enriched foods. Contrary to popular belief, you don’t have to rely on red meat to increase your red blood cell count. Dark leafy green are enriched with oxygen and suitable for all dietary requirements. 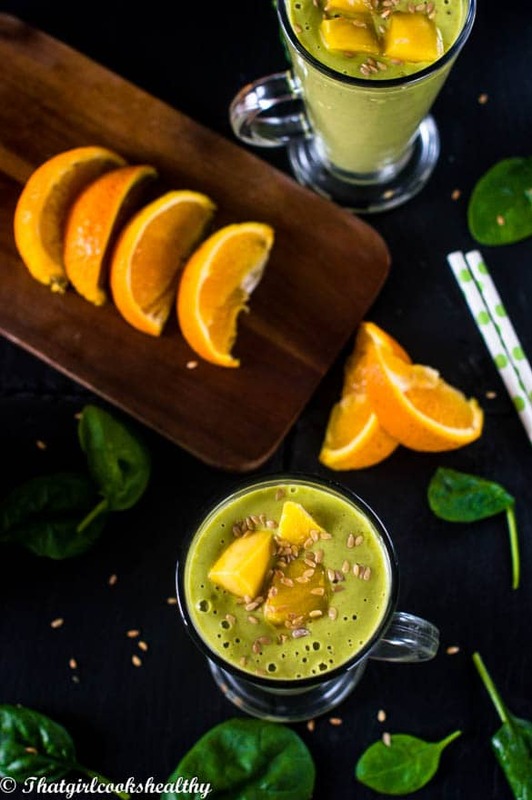 So sit back and sip on this orange mango green smoothie and reap the health benefits! Add all of the ingredients to a high speed blender and blitz into a smooth consistency. This looks wonderful and refreshing…a perfect summer drink to cool off with! Oh, all of those flavors sound wonderful! I absolutely love green smoothes and I love when I find new ones to try! Definitely nothing scary about that cocktail at all, well unless we want to say it is scarily good!! Such a wonderful fresh flavour combination. That smoothie sounds like the perfect way to start the day! Love the combination of delicious flavours with healthy ingredients. I agree Bintu, not everyone can stomach a green smoothie without the addition of fruit for sweetness.